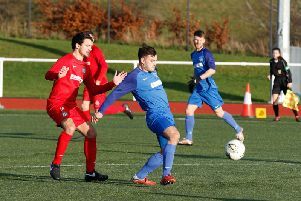 League leaders Lesmahagow Juniors managed a club record 18-0 home win over Ardeer Thistle in Saturday’s one sided League Two clash, writes Craig Goldthorp. But there was an element of farce about the game, as crisis hit Ardeer were only able to field 10 players from the start, with no substitutes. With the score 11-0 at half-time, one of the bottom club’s players refused to re-appear for the second half, so Ardeer now had only nine players. ’Gow scorers were John McStay (4), Paul Woodlock (4), Jason Thomson (4), Scott Schoneville (3), Ryan Innes, Kyle Weir and an own goal. Scottish Junior Football Association rules dictate that if Ardeer had tried to postpone the fixture, they would have incurred a £200 fine, been docked three points and asked to play the game anyway at a later date. Lesmahagow manager Robert Irving told the Carluke and Lanark Gazette: “We are sitting at the top of the league and we are happy about that. “But the game wasn’t nice to watch. “We lost 13-0 to Benburb last season and I felt just as bad on Saturday. “The game shouldn’t have been played. Junior football is stuck in the dark ages. 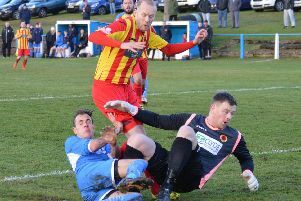 Saturday’s win comfortably surpassed Lesmahagow’s previous highest victory – which ironically was 10-1 against Ardeer – back in the 2005-2006 season. This Saturday, ’Gow visit local rivals Forth Wanderers in the league, kick-off 1.45pm.